Dr. Eyal Lederman completed his PhD in physiotherapy at King's College, London, where he researched the neurophysiology of manual therapy. He is the director of CPDO, an international center providing continuing professional development for manual and physical therapists, and is an Honorary Senior Lecturer at The Institute of Orthopedics and Musculoskeletal Science, University College London. Today I had a chance to bend his ear about his excellent paper, The Myth of Core Stability. We get into the weird assumptions and misunderstandings from the research that has caused the massive use of core stabilizing as a therapeutic approach, how dividing the trunk into “core” and “global” muscle groups is a reductionist fantasy, why the obsession with the transversus abdominus is faulty, how weak and dysfunctional abdominal muscles do not lead to back pain nor can training them prevent back pain, the futility of training people to have excessive internal focus during functional activities, how you cannot and should not continuously contract your transversus all the time, and what problems training for core stability can actually cause. Brooke: You wrote a really excellent paper called The Myth of Core Stability [in resources below]. You point out that the current ideas about the importance of core stability come out of what was actually useful research into timing and trunk control, but the way it's been implemented is based on some faulty assumptions pulled out of that research, so can you dive a little bit into the good research, and then also what are the strange assumptions people have made and applied? Eyal: Basically, we knew for a long time that when a person injures themselves, the body goes into some kind of protection strategy to prevent further damage occurring. For example with the ankle instability, when people sprain their ankles, we know that something happens to the motor control so they become unstable when they are standing on one leg and so on. Basically this research by Hodges and this team of people from Australia- they were able to show that the same protection strategy is actually is universal, and it also appears in the lower back when people have back pain, back injury, or even have the feeling of pain in the lower back. So in a way, the information is important, but it wasn’t this new, revolutionary idea. We knew that it was happening elsewhere in the body. The consequence of that is that people took this idea to mean that the recovery from back pain depends on somehow normalizing these kind of motor control issues, but we have to remember that these are protective strategy. I call it the injury response. Basically, the body is trying to prevent more injury from occurring. It’s actually a positive strategy. The fact is, yes, there are motor control, changes associated with back pain, back injury, and so on, and from there it completely blew out of proportion so people said it can protect against lower back pain, it can protect against sports injuries. It can even protect against lower limb injuries. I even saw an article recently talking about core foot muscles. Then there is a whole area of scapula stability that came also out of that for all sorts of shoulder injuries, appendicular stability, other general improvements: pelvic pain conditions, stability of cervical spine eradicating chronic cervical spinal pain, improving pregnancy pain. All these are beliefs, they are not facts. Nobody’s been able to show those kind of beliefs are actually true. Brooke: One of the things that I think came out of the research that people interpreted as core stability research, even though it was core timing research- but we can talk about that more in a bit- but one of the things that happened is that people suddenly divided the trunk into core muscles, and global muscles, and I think you beautifully said it when you said it’s a reductionist fantasy to divide these two. Eyal: Basically there are no sub-systems in the body. There’s not a sub-system called core muscles. We’d like to believe there are muscle chains and some kind of system of core, global, muscles, and so on, but it just doesn’t exist in human movement. They are organizing according to the task that the person is performing, so take any kind of situation, any kind of human movement and it involves the trunk. It’s actually very difficult to avoid activity of the trunk muscles in that case. Let’s say, if you bend forward, which muscles are core, and which muscles are global muscles, it’s very difficult to define it then. If you stand very static and very still, then you might say there are some kind of stabilizing muscles, but those muscles will change their activity if you bend forward. They are no longer stabilizing muscles. They are now movement producing muscles, so it depends on the task. You don't have a muscle in your body that is categorized as a stability muscle. It just doesn’t exist like that. Brooke: I think when we categorize them like that we think that they carry all the load of supporting us, so I thought one of the really interesting things in your paper was showing that some of the muscles that are particular darlings of the core stability idea, like the transversus abdominus, if you measure how much it’s on when we’re standing- I think if we imagine it as the thing that holds us up, or holds our spine up, we imagine it must be working at 100%, or 90%, or something. It’s doing all the job of holding us up. The amounts that those muscles that we’ve defined as core are working are actually quite small. Eyal: Yes, exactly. The research sometimes finds it difficult to differentiate between the EMG activity of these muscles to the background noise, because it’s such a low level. It’s many times we’re talking about a few percent of what the muscle can do. Brooke: And I just want to clarify for myself because I’m trying to picture it in my brain that idea that everything, of course, in us, is participating to some degree in our uprightness, in some way or another, so it’s more distributed through our system than this idea we have. The thing to remember is that the muscle is the mechanical output of the nervous system. It’s a sub-servant of the nervous system, and muscle recruitment is task specific. The muscle does not determine the task. It’s determined in the nervous system, and the muscle is just the sub-servant. It just does the job, so sometimes it’s a mover, sometimes it’s a stabilizer, sometimes it kicks a ball, sometimes it stands … It does a lot of different things and it’s completely different recruitment patterns that are needed for each one of those activities. We think about motor control in manual therapies, but we think about it too much in the periphery. Brooke: It certainly is changing my practice a lot over the years as I realize just how much I put that in the margins, just because of how I was trained to see the body. Eyal: Absolutely. It’s much easier to treat what you can see, which is muscles, joints, movement, and so on. To treat the controller is like looking into the mother board of your computer. Who wants to do that? Brooke: Speaking of these major players, the transversus abdominus, or what’s sometimes abbreviated as the TrA, or TvA, it gets special attention and focus in the core stability field. Why do you think that has happened, and what is a little faulty about that focus? Eyal: It’s a little bit like you break up things so you can sell them off individually. That’s how it works. It works in fads, a lot of this stuff. It used to be that the abdominus, now it’s the foot core muscles, it was then the latissimus, and then there’s a whole system develops around that. here is a commercial element in it. Let me ask you a simple question. If you were unable to walk, for some reason, and you want to retrain for walking, what would you think would be the best approach? Eyal: Absolutely. It’s very, very simple. The problem is that if you came to me, and I said, “Just walk,” you’d look at me and say, “Can I have my money back, and I don't want to ever come back again, because if I can do walking, why should I bother coming to you?” There is this whole approach of trying to break things even further and selling them off as important pieces. But really, the basic thing is if you want to learn to walk, just walk. I’m not necessarily saying that people are trying to scam us off, but it’s the whole way that we are taught about the body and how it functions, is along this way of breaking things up into smaller and smaller units, and trying to rehabilitate the the body muscle by muscle. Brooke: I think a lot of it is just the way we’re trained and the lens that we see the whole world through of smaller parts, bits and pieces. Eyal:But think about it. When you started learning anatomy, Gray’s Anatomy was your book, presumably? Brooke: Gray’s, and Netter, yeah. Eyal: So you open the front page, and you’ve got all the superficial muscle layers. Go to the middle of the book, and you see all the intermediary muscle layers, and somewhere at the back cover, there is the very deep layer of muscles. In our mind, the professional mind, from a very early young age, we are led to believe that muscles are somehow separated anatomically, and functionally, and there is a distance, there is a void of some kind between them that we can choose, pick out the muscles that we want to work, and exclude all the others because of this image that we have in our mind. Also, the research doesn’t help us, sometimes, research quite often sticks one or two electrodes here and there. It never sticks electrodes in all the muscles, so very quickly we get the image that only certain muscles are important in certain movements, while others are not. It’s something about the whole education that’s the problem. Brooke: Yeah, we really get indoctrinated. I feel like, for me, anyway, it’s a lifelong process of unlearning separateness, but it’s definitely the way my brain …. It’s the automatic path my brain goes into. Eyal: Absolutely. If you’re looking for muscle chains, or individual muscles, and so on, you need a knife. You need to actually cut the body up with a knife to do that. Brooke: I’m going to read a really bold, straightforward, clear sentence from your paper, "Weak, or dysfunctional abdominal muscles will not lead to back pain", Because I just think sometimes we need to hear it, bold. You point out some really compelling research with pregnant women that demonstrates that pretty clearly. Eyal: Yes, but even before we go to research, sometimes the simple questions are the most important ones. I always put rationality before research. If you think about it, if people get back pain because they have some problem with their core muscles, in some way, does it mean that all the people that don't have back pain have normal core muscles? Can you see that there is a problem here? Eyal: I know a lot of people who don't exercise, don't do anything, and according to some kind of a core ideal, they might not have fantastic core control, and so on, and yet they never get back pain, and so on, so these are the kind of questions we need to ask ourselves whenever there is a new idea raised, or a new principle, just ask the most simple question, and if you can’t answer it, there is something wrong with the research, probably. Going back to the research you mentioned, it was an interesting study, because people were saying if we disturb the abdominal muscles in some way, would that lead to back pain? Pregnancy’s a very good test of that because you can imagine the amount of distention, and stretching that the abdominal muscles will undergo during the 9 months. And the post-partum period, from that stretched situation, then going to become completely lax the moment the baby’s born. Under these circumstances the core muscles don't exist. They are going to take about 4 to maybe 6 weeks before they begin to return to some kind of normality. So according to the core theory, we would expect pregnant women, women post-partum, to develop severe back problems. Even in a very large study, I’ve got it here, actually, they took almost 850 pregnant women, and they looked at them immediately once they gave birth, and what they were assuming that all these women will have a lot of back pain, so they enrolled them on a core stability type of exercise regime. To their surprise, once they gave birth, 635 were excluded because their back pain from pregnancy improved within one week of delivery. You can’t get better proof than that. It’s very obvious that we really, really don't understand the biomechanics of backs at all, because when you start thinking about it, after delivery, when woman would be so physically active, and under a lot of stress, you just wonder how does the whole thing hold together, the whole area of the lower back, the abdomen. Why doesn’t it just collapse on itself? But it doesn’t. It’s actually quite robust, and women can go through great physical challenges during the time, and without seemingly any kind of great injury. That knocks out the whole idea that strong core muscles, or timings, are important to prevent back pain, or cure back pain, and so on. There’s a lot more research around that, though in fact, with 5, maybe even 6, systematical reviews, so we’re not talking about 1 or 2, we’re talking about 5 or 6 that show that there is no correlation between back pain and core, and so on. Brooke: The original research showed timing issues, not strength issues, yet we keep trying to fix the timing issue by strength training, specifically the transverses. Eyal: Yeah, crazy stuff. It’s just two completely different motor control issues: timing, and force production. So just making something stronger doesn’t necessarily change its timing at all. In order to change timing, you need to work on timing, but then you are into serious difficulties because we are talking about one fifth of a millisecond [correction: one fifths of a second]. How the heck are you going to correct that? Brooke: Right. It’s tough to consciously control one fifth of a millisecond [correction: one fifth of a second]. Eyal: Very, very difficult. You can only do it by probably doing faster and faster movement. That’s all. There’s no other way that you’ll be able to do that. Brooke: You gave a great analogy in your paper that it’s like trying to play the piano faster by doing slow pushups to train for it. I thought that was great, because it gives such a good visual. Eyal: It’s always a mistake that people try to improve the performance, but they are taking the cues from the fitness industry, so we think that if they are stronger, and have less fatigue, they’ll be able to perform, but it’s not always the case. Brooke:Yeah, we keep chalking everything up to weakness, it seems like. To counteract this timing issue, and the fact that it’s really, really hard, maybe impossible to work on one fifths of a millisecond [second[ timing issue consciously, the proponents of core stability have come up with a solution to basically continuously contract the core to override this timing issue. Eyal: Basically you are teaching a person to change the way they are carrying out certain tasks, like walking, or bending, or lifting, by adding their contraction. Basically, to tense the trunk muscle, you need a strategy of core contraction. Core contraction is very minimal in normal human movements such as bending, lifting, and carrying. It’s no more than a few percent of the total of what a muscle can do, so there is a kind of … Not a trade off, but if you increase the core contraction, you do increase stability but you also, in the same time, increase compression on the joints, which can be damaging, so the body has got it balanced in a beautiful way. It knows what it’s doing. It’s keeping it above maybe 1, or 2 %, of the full voluntary contraction of what a muscle can do, but if you start raising it, then you run into the danger of damaging your discs, and so on. Brooke:It’s such an important point, because I think sometimes people feel like, What harm can it do? Stronger is always better, and we forget that there is this issue of compression, and compression, for a lot of people, is a big part of the problem. Eyal: And this issue of strength is everywhere, so, for example, imagine a situation where someone has a meniscal problem … A lot of therapists, they would say you need to strengthen the leg muscles, or if you want to prevent meniscus injuries, maybe you should strengthen your leg muscles. When you start thinking about it, how is that really going to change the forces going through the knee? If anything, it’s going to increase them, rather than reduce them. Brooke: Right because everything’s getting squished more. The volume’s turned up on that knee now. Eyal: Also, if you have bigger muscles, it doesn’t mean that you are using them more when you are walking or running, because of energy conservation, you’re going to always go to the default level that you need for that movement. Do you see what I mean? Brooke: I do, yeah. My brain is very excited to digest that over the next several weeks. Eyal: So let’s say, if you’re training in the gym, and you’ve got these huge biceps, it doesn’t mean that when you lift the spoon to your mouth to eat you’re using a lot more force than maybe a normal person. It still would be the same force to lift that arm. Now it’s going to be a bit heavier because it’s got all this muscle muscle in it, but essentially, it’s the force you need to carry out the task. The muscle doesn’t determine the force that is going to be used during the task. It’s centrally controlled. The muscle doesn’t control anything. It doesn’t determine it in that way. The task is the determinant, the recruitment is determined centrally, and not peripherally. Brooke: This brings me to the similarity principle in motor learning as well, and I’m going to pull a quote from you again because it’s a really clear way to describe it, but you say, “We can’t learn to play the piano by practicing the banjo,” and so in the case of core stability what that looks like a lot is learning to contract transversus abdominus while lying on the back. Eyal: That’s right. We know from research it doesn’t transfer to other physical activities, walking, and standing, and so on. It shouldn’t, because otherwise we would have one universal exercise that improves all other human activities, and nobody’s evert found that, and that’s a problem with core stability, that people immediately imagine that it’s that universal exercise, that if you do core stability, then everything else you do in your life will improve dramatically, and of course it doesn’t work that way, because what happens during core stability training you are becoming very good at doing core stability training, the task itself. You’re learning, basically, a new task. Clinically, it might look great, but functionally it has no effect. It’s very confusing clinical improvement versus functionality improvement. Remember the patient is only interested in getting the functionality recovered, not in learning a new task in clinic. It doesn’t mean that they can walk more efficiently, or play golf better, something like that, because in order to walk you need to walk. In order to play golf you get to train by playing golf and so forth, and not by doing something on the floor, which is completely dissimilar. Brooke: Right, so simple, and yet so easily forgotten about. We have to do the things we want to know how to do. Eyal: The problem is again in our education. How many manual therapy courses including osteopathy and chiropractic trainings do you see people learning about motor control, and movement control? Next to nothing. The focus most of the time is on anatomy, and quite often a therapist if they are faced with some kind of clinical conundrum, they would go back to their anatomical text books quite often to try to solve it, why the person is not getting better. That’s still the case, at least here in the UK. Brooke: It is here too, for sure. Eyal: I teach a lot all over the world, and I would say it’s pretty universal, this approach. Brooke: A lot of what I’m hoping to do with my work is to build more bridges between the manual therapy and the movement therapy world, and I think we want those bridges. It just comes down to our training, needing to have more of them built in in the beginning, because we don't realize what we’re missing until we discover we were missing it. Eyal: Absolutely. Think about it from this point of view. The numbers of hours in a week are something like 168. Out of that period say an osteopathic treatment is about half an hour. By the time you take a case history, you chat with the patient, get them dressed and undressed, whatever, you’ve lost another good 10 minutes, sometimes even 15 minutes, so the actual treatment, the manual therapy treatment is about 15 to 20 minutes, maybe half an hour, okay? That’s half an hour of 168 hours, so the big questions for us is where does the therapy take place? How does it work? The balance is in what the patient does themselves. It becomes really, really important, and maybe we can talk about it later, about the fact that we are not taught enough about self-care education for the patients. We assume that everything happens in the clinic, but if you look at it from this point of view, it really is, a lot of what is happening is out there, what the patient does after the treatment. You point out the futility of excessive internal focus during functional activities, and I think you communicated about that really beautifully too. You broke it down in this way where you made it clear that we can’t really know the nuance of every movement, so say we’re describing a squat to somebody, we can’t say, “Contract your gluteus maximus this percent, and then lengthen your tibias interior this percent,” you can’t juggle all those balls when you’re doing a movement. Eyal: Maybe let’s explain what’s an internal/external focus of attention. If I throw a ball, I can focus externally on that goal of my movement, which is to get the ball into the basket, or I can have an internal focus of attention where I’m focusing on the angle of my elbow, or the force I’m using with my biceps, and so on. This has been researched quite thoroughly … They take 2 groups, and they asked them to do a very simple task of lifting a dumbbell to a certain height. One group is given an external focus of attention, just lift the dumbbell to this level, and the other group is given an internal focus of attention, lift it to this level, but focus on your biceps and the angle of your elbow, say. What is surprising is though it’s exactly the same weight, and exactly the same movement, the people that are using an internal focus of attention are the EMG activity is much higher and less efficient in carrying out of the movement. This has been shown for other activities, such a jumping. If you ask people to jump to a certain height, one group, you ask them to focus on the feet, and another one on the external goal, which is to reach that level, you find the same kind of thing. The ones that are focusing internally are less efficient in the movement. Also, other repercussions: motor learning is slowed down quite often when too much focus of attention is given in the beginning. It’s definitely not useful for experts. It’s good when you’re starting to learn a movement, but later, very quickly, you want to move into an external focus of attention. Most of our patients are not novices in movement. They are people who have the experience, the motor control of walking, running, kicking a ball, and so on. It’s just that they can’t do it any longer, either because the motor control has changed, following some injury, or in the periphery, there is pain, there is damage, or, they are experiencing pain, so they are not really learners. They are the experienced injured, so there’s no point in taking them back to a learning mode where you use some internal focusing, it’s better to keep it on the whole task, to focus externally. The research very much supports that. Brooke: Just as a practical example that you gave in your paper too… Does Michael Jordan think about what his core is doing, and how his lat is functioning when he’s throwing a ball? Brooke: I know. “I’m thinking about my core the entire time. That’s why my career is so amazing." That would be embarrassing, but informative, so Michael Jordan, if you’re listening, feel free to give a call. We’ll talk about it. What are some of the potentially damaging effects of training, specifically for core stability, and looking to always have a certain degree of stabilizing in the core, contracting in the core? Eyal: The most immediate danger is that it’s financial. You’re going to lose a lot of money, a lot of nothing, basically. Really. As far as the core exercises themselves are not really dangerous in any great way. Most of them are done on the floor. There’s very little resistance, or force applied to the body. I would say mostly safe exercise, safe as another exercise, really. I’m not too worries about the negative issues of it. I’ll tell you where the real problem is. The real problem is that in my clinic I get patients that come in with back pain, that have been to therapists other than me, and the condition has been pathologized to a new degree. They are now told that they’ve got flat feet, and that’s why they’ve back pain, their pelvis is rotated, their core muscles are not working anymore. They are weak, and unless they do something about all this, they’ll never get better. That’s the real problem, so what we are doing is what we blame sometime the medical profession in doing is that we pathologize it even further, simple things. You can imagine, a patient comes to us. They’ve only got a back pain. They’re worried about a back pain, and now they’ve got to worry about their posture, they’ve got to worry about their pelvis, and they’ve got to worry about their core muscles not working very well. It can be quite difficult to change that mind-set, actually. Once a patient has been bought into it, it’s really, really difficult to do that, and not always possible, because it fits this point of view of medicine and our culture that our body’s a mechanical entity, and as a mechanical entity it behaves like a washing machine, or our car. It can break down, and we can fix it by fixing it mechanically, or strengthening the something, the guy ropes that hold it together, something like that, so it’s very difficult for the patient not to see their body as a mechanical entity, but to see it more as a biological entity, and that the condition is in the biological dimension, and not the mechanical dimension. It’s hard enough for us. Can you imagine to someone who doesn’t have all this kind of knowledge? It can be very, very difficult. The problem is we’re basically talking about a structural model here, about structuralism in manual therapies and physical therapy, and this model is really old. We’re talking about 500 years of structuralism, and only in the last maybe 20 or 30 years, we understand, for example, we understand that back pain is something that happens more in the biological dimension, and there’s no correlation between back pain and any kind of biomechanical measurements. That’s the problem. Brooke: I would love to touch on that a little more because I think that our view of why does back pain happen, especially considering the statistic in the United States is something like 80% of the population experiences it at some point. What are some of the causes that we’re seeing of this that can shift our view out of this structuralist model? Eyal: The answer is we have absolutely no idea why people get back pain. It’s some kind of random mishap in nature. I can’t explain it more. The only thing we can say, that if someone had a back pain, they are more likely to get it again. The other factor is genetics, so maybe up to 60% of back pain can be explained by hereditary factors. I looked at the research very thoroughly. I’ve read over 300 different articles about back pain, and biomechanical and postural factors. There is absolutely no correlation between those 2 things. It is really baffling because it almost seems obvious that it should be, because again, we think of the body as a mechanical entity, so if you strain it, and if you do a lot of things on it, and if its misaligned in some way, then it should fail, but it doesn’t, and there’s a good reason for that why, and that’s because we have reserves in our body. We can lose some of the tolerance … Let’s say we have a large tolerance in our body, so we can lose some things before something terrible happens to us. If we lose a bit of, say, trunk muscle strength, it doesn’t matter, because we’ve got more than we need. We’ve got reserves. A lot of different, small changes in our body are like that … They don't necessarily lead to some kind of catastrophic outcome. Eyal: The way it works is usually you learn, you learn, you learn, and then you really know something, and then someone comes around and says, “Actually, sorry, it doesn’t work like that,” and then you have to spend the next 10 years relearning it again for the next person to come around and say, “No,” the same kind of thing, especially in what we are doing can be very confusing. Brooke: I tell you, this podcast is a great way for me to keep realizing that I don't know anything, but it’s really fascinating to keep learning. To wrap up, is there anything that you are currently fascinated by in your own practice, or teaching or learning these days? Eyal: I’m very much interested in replacing the structural model in the manual physical therapies, so, I have an alternative model which is called the process approach, and the idea there is forget about structure. Don't worry about it too much. Ask yourself a simple question: "How is this patient going to recover?" And the idea there is that we have 3 body processes that are associated with recovery. If you sprain your ankle, or you have the surgery, you’re going to recover by a repair process. If you say we’ll immobilize in a plaster cast for a few weeks, you’re going to recover your range of movement by an adaptive process. There is a third possibility of recover, and that is imagine one of your patients comes with back pain. We take an MRI scan of the back before the treatment, and say, about 3 or 4 weeks after you have treated your patient, and the patient’s absolutely pain free, but are you expecting to see a difference between the 2 MRI scans? The answer is probably not. Another possibility of recovery is through modulation of symptoms. They feel less pain, so the patient, as far as they’re concerned, has recovered, and that happens a lot in a lot of different conditions. When I see a patient, this is the question that I will ask myself, “How is this patient likely to improve their condition?” and it could be a combination of all those 3, or particularly one of them. The idea there is to create, with a patient, to co-create an environment that support these body processes, so the focus is on the positive all the time. Okay, you’ve got this pathology, fine, what’s next? How is your body going to recover? How are you going to recover? What can we build it together to facilitate that recovery? Brooke: I love that. It reminds me a lot … I was just reading the other night … It’s a completely different field, but about aid, foreign aid to countries that are constantly impoverished and we’re realizing a lot there that it creates this constant cycle of telling people that they’re incapable of creating solutions for their own lives, so there are all these new, wonderful, people creating systems where you go into the community, you let the community leaders co-create systems for their own recovery, and t’s the same with the human body. I think that when people get dependent on …Like you were talking about, they’ve been pathologized by so many different care providers, whether allopathic, holistic, all of us do it. That’s wonderful that you’re working with people in that way. I think that’s going to be profoundly impactful for a lot of people. What better thing to play with than core stabilization? Choose a normal daily activity like taking a walk or cooking dinner and first try to do it while consistently contracting your core. Then let it go and let your core do its normal pre-conscious thing where it responds to and participates in whole body movement. What do you notice? Even though he was considered conventionally “strong” Eric Goodman was a broken down mess at 25 who had major spinal surgery recommended to him. 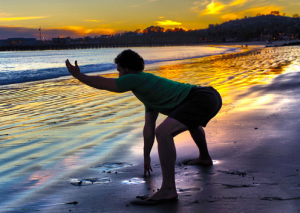 The creation of the Foundation Training is the culmination of figuring out how to heal his injuries and back pain himself using his anatomy and chiropractic training. We talk about our super compressed modern bodies and what that means for us, what the posterior chain is and why rehabilitating its functional strength and integration matters, how outdated our conventional notion of the core is- and what “core” actually means, and how it’s possible that an x-ray of Eric’s spine today would still show a big old mess there, and yet he is pain free. The major back surgery that was recommended to him at 25. How he used to have the conventionally “strong” body but was so broken down. Foundation Training is the culmination of 8 years of figuring out his back injury himself using his anatomy and chiropractic training. The spine and hips should the strongest part of your body rather than the spine being the main mover of the body which is what many people are doing these days. The modern body is super compressed- we are losing the war against gravity terribly. What about the digestive issues, the depression, the mood issues- these are just other forms of compression. Posterior chain inside jokes ensue. Defining the posterior chain and why to focus on it in the modern body. The deep front line- the anterior chain is not supporting us and connecting well. Posterior chain integration is key- most people need their posterior chains to get a lot stronger and a lot longer in order for their lives to get better. The notion of the core as outdated: A contracted abdomen literally pulls you into a ball- shoulders as well. When the abdomen lengthens and learns to hold tension the lower back lengthens and learns to hold tension, and the posterior chain then starts to integrate. Redefining the core- it is the center of your body. This, skeletally, is your pelvis. Your core musculature is anything that supports your pelvis in space. Next book isn’t just on back pain but on the larger cultural problem of compression. Trying to get the body back to tensegrity. Foundation Training is pure muscular counterbalance. How and why simplicity gets overlooked- the bias towards complex procedures. How an x-ray of his spine today would still show the degeneration, yet he doesn’t have pain. Explaining to people how that’s possible. He describes his extreme diagnosis. If you think that you're going to control an injury without addressing the environment around that injury, you're wrong. The communication between the neurotransmitters in the digestive tract and the neurotransmitters in your brain have a lot to do with how much pain you experience. The body is this infinite web of communication. Western medicine might be the most important thing in the world when it comes to emergency situations, but it might be the wrong group to give us advice on daily living. Doctors are groomed to be elitist- they are not arrogant, but they are groomed to believe that the information they have is much more significant than the information coming from others. And they have extremely valuable information, but they are in a system the suffocates them. And they have learned how to fix, not how to prevent. Self-care is so much more significant to society than healthcare. If patients started realizing their ability to take care of themselves it would free up so much time and energy in our healthcare system. Eric's current interest in using a slackline to play with balance, and getting really strong and healthy in your core (and everywhere). A link to a good slackline is below in the resources. The next book is upcoming between February and April 2015- stay tuned!